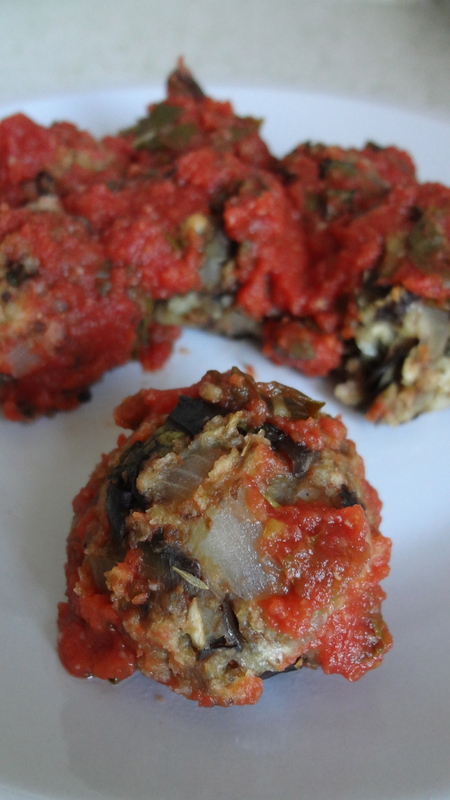 I had the most delicious eggplant meatballs at King’s wine bar in south Minneapolis a few months ago, and I had to figure out how to make them for myself. Turns out, they’re actually pretty simple. This recipe uses a food processor (which I love!) to speed things up even more. These “meatballs” are plenty meaty on their own – they’d make a great appetizer, or a tasty vegetarian meal when topped with tomato sauce and a little cheese. If you’re looking for a way to use up the last eggplants of the season, surprise your meat loving friends with these pseudo-meatballs and see if they complain. 1. Preheat the oven to 375 degrees F. Lightly oil a baking sheet. 2. Heat a large skillet and sprinkle in 2 tablespoons olive oil. When the skillet is hot, add the onion and sauté on medium-low until translucent, about 5 minutes. 3. Add the eggplant and a sprinkle of salt and sauté until the vegetables are soft and fragrant, 8 to 10 minutes. If the eggplant dries out too quickly and begins to stick, add a bit more olive oil. Transfer to a large mixing bowl. 4. Add the walnuts, if using, to the eggplant and mix thoroughly. Transfer a generous cup of the eggplant mixture to the food processor. Process until pureed and return to the bowl. Add the bread crumbs, eggs, Parmesan, Pecorino, garlic, zest, parsley, oregano, basil, 1 teaspoon salt, and black pepper and mix well. If the mixture seems too dry, add the remaining tablespoon or more olive oil. 5. Rub a little olive oil on your palms and shape the meatballs with your hands, using 2 heaping tablespoons of the mixture at a time. Each meatball should be about the size of a golf ball. 6. Place the eggplant balls on the prepared baking sheet. Bake 25 to 30 minutes, until a deep golden brown with a nice crust. Remove the pan from the oven, cover with foil to slightly steam the balls, and allow them to rest for a few minutes. 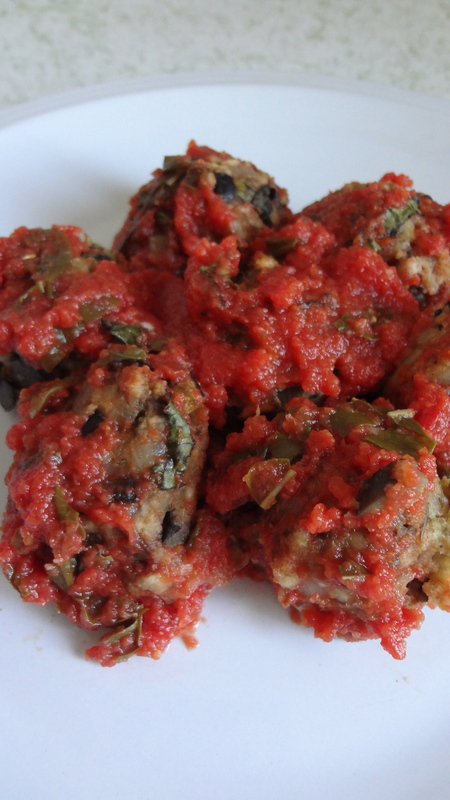 This entry was posted in Uncategorized and tagged Eggplant, eggplant meatballs, summer meals, Tomato sauce, vegetarian meatballs by theculinarycapers. Bookmark the permalink.